Why have Reiki at Therapy House? Do you feel that your physical and/or emotional wellbeing is in need of some care and attention? Are you feeling run down, low or anxious? Or maybe you’re currently recovering from an injury or surgery? Reiki is an excellent holistic treatment to help you relax and regain your health. It can help you to reduce pain, lower your anxiety levels, increase your energy, manage physical symptoms, reduce the side effects of medications, and support your recovery from an injury or recent surgery. Many people find that having Reiki treatments helps them to feel calm and centred so that they are better able to consider medical treatment options or identify lifestyle changes that could help bring their health back into balance. Reiki can be offered alongside other health interventions. Reiki (pronounced Ray-kee) is a Japanese word meaning ‘Universal Life Energy’, i.e. an energy which is all around us. 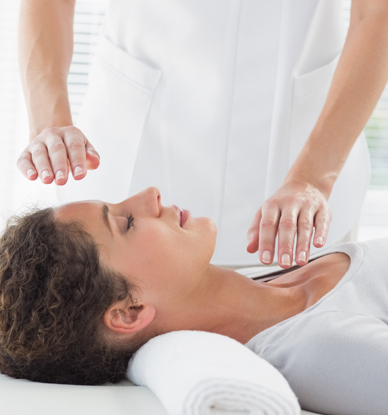 Essentially, Reiki is a healing technique based on the principle that the therapist can channel energy into your body to activate its natural healing processes. Reiki treatments are simple and therapeutic. After taking a short case history, our practitioner will invite you to lie down and relax, although if you can’t lie down, sitting is perfectly fine – the main thing is that you are as comfortable as possible. The practitioner will then place their hands over your whole body in a set sequence without actually touching you so that you’re treated holistically rather than for specific symptoms. Reiki will pass through all materials, even plaster casts, so there’s no need to remove any clothing. A full treatment usually takes up to an hour and a half with each position held for several minutes. How often should I have Reiki? Even one Reiki treatment should make a difference, but many people opt to attend regular treatment sessions because this offers cumulative benefits. There are no limits to how often you can have Reiki and we will work with you to create the right treatment plan for your needs. Because Reiki uses gentle, healing energy, it is suitable for people of all ages, including young children, pregnant women, surgical patients, and older people. Reiki does not take the place of conventional medicine. If you have any health concerns, you should always consult your GP.